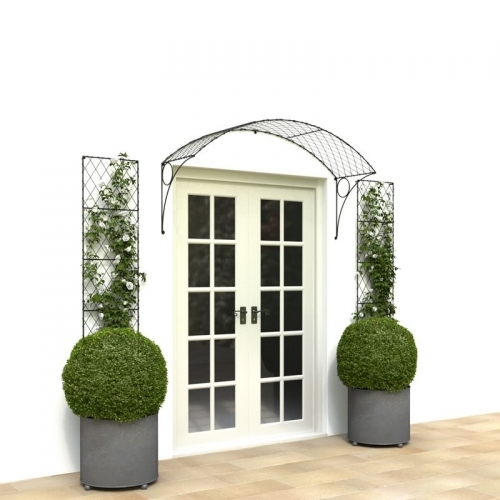 An 18″ deep Segmental door canopy in lattice wirework, shown in the black painted finish. The 4’6″ high wall trellis panels and 18″ circular steel planters are shown in the aged galvanized finish. Our wirework door canopy is arched to support climbing plants away from your door. Made from solid steel, the canopy is zinc galvanized before being painted or Aged zinc to achieve a mellow zinc patina that is similar to lead. 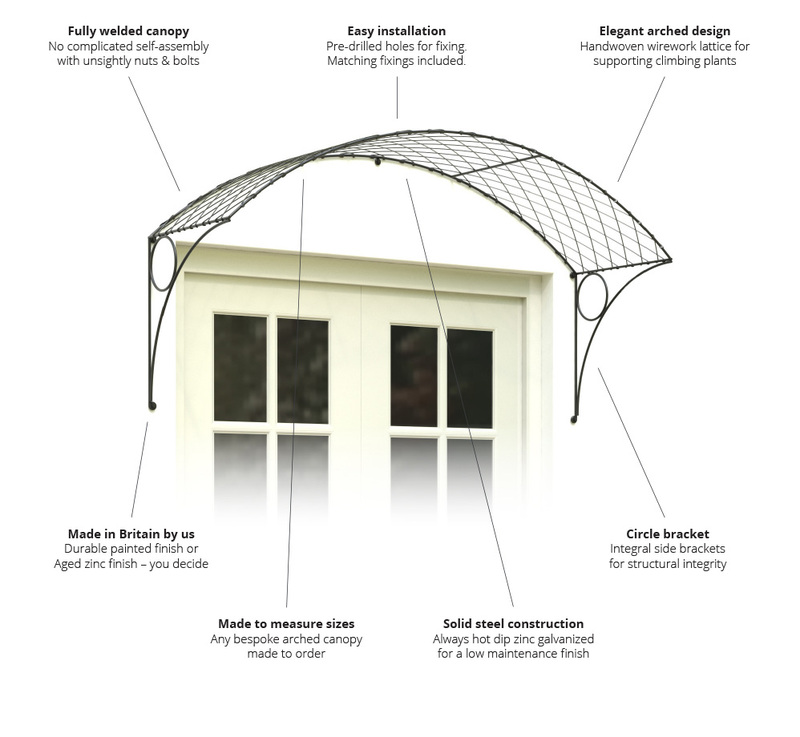 The diamond latticework is a perfect solution for front doors or patio doors. We put our painted door canopy up over our back door at the weekend and it looks lovely. We’re so pleased with the quality and finish. All of our materials are sourced from British suppliers. We use solid steel to manufacture every product in our ranges. Once the product has been made, it is hot dip zinc galvanized to a recognised British Standard EN ISO 1461 to form a corrosion resistant finish. The product on this page is available in the finishes shown above, is made from solid steel then hot dip zinc galvanized before finishing. To view these finishes in more detail and for more information about each one, please visit our Finishes page. Bespoke finishes to order. Width – To ensure that you select the most appropriate canopy size, please measure the width of the doorway from wall to wall. We recommend a minimum of 3”/75mm canopy overhang both ends. Height – This will depend on the canopy design and the wall height above your doorway. If there is restricted height, please measure this and get in touch. The standard Segmental wirework door canopy has several lugs along the inside edges and an eyelet at the bottom of each bracket for receiving the hexagonal head coachscrews (supplied). Ensure that the holes are drilled deeply enough to receive the screws. We can arrange delivery throughout the United Kingdom. We use an independent courier that offer next day delivery. Canopies are from £39.50, the price will depend on the number of items and weight of your order; we’re happy to provide a quotation prior to placing your order. Once ready, we will contact you to arrange a convenient date for delivery. For full delivery and payment details, please see our terms and conditions. We can arrange packaging and shipping services worldwide using an independent carrier. The price will depend on the number and weight of packages and final destination. We can provide a quotation prior to placing your order. Once ready, we will contact you to arrange a convenient date for delivery. For full delivery and payment details please see our terms and conditions.